Pope Leo III (Latin: Leo; fl. 12 June 816) was pope from 26 December 795 to his death in 816. Protected by Charlemagne from his enemies in Rome, he subsequently strengthened Charlemagne's position by crowning him Holy Roman Emperor and "Augustus of the Romans". Leo was assaulted in Rome by partisans of the late Pope Adrian I, and fled to Charlemagne at Paderborn. The King of the Franks arbitrated the dispute, restoring Leo to his office. Leo subsequently crowned Charlemagne as Roman Emperor, which was not approved in Constantinople, although the Byzantines, occupied with their own defenses, were in no position to make much opposition. Leo was of a modest family in southern Italy, the son of Atyuppius and Elizabeth. At the time of his election he was Cardinal-Priest of Santa Susanna, and seemingly also vestiarius, or chief of the pontifical treasury, or wardrobe. He was elected on the very day his predecessor, Adrian I, was buried (26 December 795), and consecrated on the following day. It is quite possible that this haste may have been due to a desire on the part of the Romans to anticipate any interference of the Franks with their freedom of election. With the letter informing Charlemagne that he had been unanimously elected pope, Leo sent him the keys of the confession of St. Peter, and the standard of the city, and requested an envoy. This he did to show that he regarded the Frankish king as the protector of the Holy See. In return he received from Charlemagne letters of congratulation and a great part of the treasure which the king had captured from the Avars. The acquisition of this wealth enabled Leo to be a great benefactor to the churches and charitable institutions of Rome. While Charlemagne's letter is respectful and even affectionate, it also exhibits his concept of the coordination of the spiritual and temporal powers, nor does he hesitate to remind the pope of his grave spiritual obligations. Charlemagne's reply stated that it was his function to defend the Church, and the function of the pope to pray for the realm and for the victory of his army. Prompted by jealousy or ambition, or the thought that only someone of the nobility should hold the office of pope, a number of the relatives of Pope Adrian I formed a plot to render Leo unfit to hold his sacred office. On the occasion of the procession of the Greater Litanies (25 April 799), when the pope was making his way towards the Flaminian Gate, he was suddenly attacked by a body of armed men. He was dashed to the ground, and an effort was made to root out his tongue and tear out his eyes which left him injured and unconscious. He was rescued by two of the king's missi dominici, who came with a considerable force. The Duke of Spoleto sheltered the fugitive pope, who went later to Paderborn, where the king's camp then was. He was received by the Frankish king with the greatest honour at Paderborn. This meeting forms the basis of the epic poem Karolus Magnus et Leo Papa. His enemies had accused Leo of adultery and perjury. Charlemagne ordered them to Paderborn, but no decision could be made. He then had Leo escorted back to Rome. In November 800, Charlemagne himself went to Rome, and on 1 December held a council there with representatives of both sides. Leo, on 23 December, took an oath of purgation concerning the charges brought against him, and his opponents were exiled. Charlemagne's father, Pepin the Short, defended the papacy against the Lombards and issued the Donation of Pepin, which granted the land around Rome to the pope as a fief. 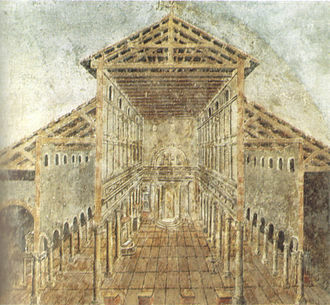 In 754 Pope Stephen II had conferred on Charles's father the dignity of Patricius Romanus, which implied primarily the protection of the Roman Church in all its rights and privileges; above all in its temporal authority which it had gradually acquired (notably in the former Byzantine Duchy of Rome and the Exarchate of Ravenna) by just titles in the course of the two preceding centuries. Two days after Leo's oath, on Christmas Day 800, he crowned Charlemagne as emperor of the Holy Roman Empire. According to Charlemagne's biographer, Einhard, Charles had no suspicion of what was about to happen, and if informed would not have accepted the imperial crown. 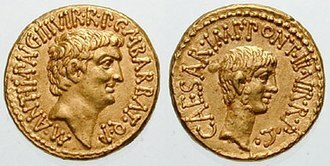 On the other hand, there seems no reason to doubt that for some time previous the elevation of Charles had been discussed, both at home and at Rome, especially in view of two facts: the scandalous condition of the imperial government at Constantinople, and the acknowledged grandeur and solidity of the Carolingian house. The coronation offended Constantinople, which had seen itself still as the rightful defender of Rome, but the Eastern Roman Empress Irene of Athens, like many of her predecessors since Justinian, was too weak to offer protection to the city or its much reduced citizenry. In 808, Leo committed Corsica to Charlemagne for safe-keeping because of Muslim raids, originating from Al-Andalus, on the island. 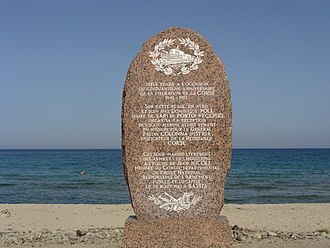 Nonetheless, Corsica, along with Sardinia, would still go on to be occupied by Muslim forces in 809 and 810. On Christmas Day in 800, Leo crowned Charlemagne Holy Roman Emperor at Old St. Peter's Basilica in Rome. Under Charlemange's leadership there arose a cultural enrichment still known as the Carolingian Renaissance. Charlemagne gathered to his court the cream of available intellect, centered on the scholar Alcuin, whom he brought from York in England. Monks and other copyists were set to transcribing ancient manuscripts, both classical and Christian, for the preservation and extension of learning. Schools were established at monasteries and cathedrals, the forerunners of the great universities. Myriad hymns and poems were composed, along with commentaries on Holy Scripture, treatises on music, theological works, and numerous chronicles of history. Leo helped restore King Eardwulf of Northumbria and settled various matters of dispute between the Archbishops of York and Canterbury. He also reversed the decision of his predecessor Pope Adrian I in regards to the granting of the pallium to Hygeberht, Bishop of Lichfield. He believed that the English episcopate had been misrepresented before Adrian and that therefore his act was invalid. In 803, Lichfield was a regular diocese again. Leo forbade the addition of the filioque to the Nicene Creed, when asked to confirm the decision of a Council of Aachen held in 809. Although he approved of the doctrine expressed by the filioque, he also ordered that the Nicene Creed, without filioque, be displayed on silver tablets placed in Saint Peter's Basilica, adding: "Haec Leo posui amore et cautela orthodoxae fidei" ("I, Leo, put these here for love and protection of orthodox faith"). The reasons for the coronation of Charlemagne, the involvement beforehand of the Frankish court, and the relationship to the Eastern Roman Empire are matters of debate among historians. An effective administrator of the papal territories, Leo contributed to the beautification of Rome. Leo III died in 816 after a reign of more than 20 years. He was originally buried in his own monument. However, some years after his death, his remains were put into a tomb that contained the first four Popes Leo. In the 18th century, the relics of Leo I were separated from the other Leos, and he was given his own chapel. 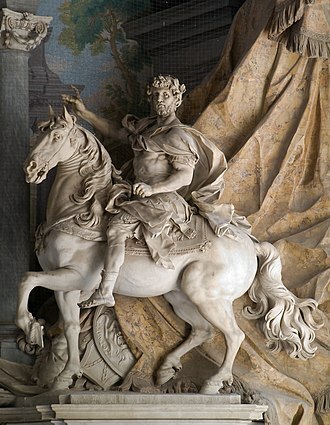 Leo III was canonized by Pope Clement X, who, in 1673, had Leo's name entered in the Roman Martyrology. ^ a b Miranda, Salvador. "LEONE (?-816)". The Cardinals of the Holy Roman Church – Biographical Dictionary. Florida International University. Retrieved 2018-04-24. ^ a b c d e Mann, Horace Kinder (1910). "Pope St. Leo III" . In Herbermann, Charles. Catholic Encyclopedia. 9. New York: Robert Appleton. ^ a b c d Shahan, Thomas; Macpherson, Ewan (1908). 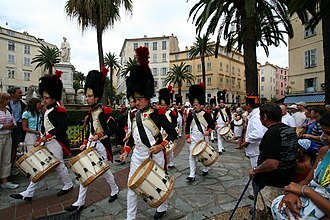 "Charlemagne" . In Herbermann, Charles. Catholic Encyclopedia. 3. New York: Robert Appleton. ^ Einhard (1880). "Charlemagne Crowned Emperor". The Life of Charlemagne. Translated by Turner, Samuel Epes. New York: Harper & Brothers. ^ Raymond Davis (1 January 1995). The Lives of the Ninth-century Popes (Liber Pontificalis): The Ancient Biographies of Ten Popes from A.D. 817–891 (illustrated ed.). Liverpool University Press. p. 93. ISBN 9780853234791. ^ Noble, Thomas F. X. (1 January 2011). The Republic of St. Peter: The Birth of the Papal State, 680-825. University of Pennsylvania Press. p. 173. ISBN 9780812200911. ^ Pirenne, Henri (7 March 2013). Mohammed and Charlemagne. Routledge. p. 160. ISBN 9781135030179. ^ Reardon, Patrick Henry (2006). "Turning Point: The Crowning of Charlemagne". Christian History Biography. No. 89. Christian History Institute. Retrieved 24 April 2018. ^ Moyes, James (1908). "Councils of Clovesho" . In Herbermann, Charles. Catholic Encyclopedia. 4. New York: Robert Appleton. ^ "Agreed Statement of the North American Orthodox-Catholic Theological Consultation, 25 October 2003". United States Conference of Catholic Bishops. Archived from the original on 7 March 2012. Retrieved 23 April 2018. ^ Reardon, Wendy (2012). The deaths of the Popes. McFarland. p. 41. ISBN 9781476602318. ^ Baring-Gould, Sabine (1874). The Lives of the Saints. J. Hodges. p. 156. Retrieved 24 April 2018. Wikimedia Commons has media related to Pope Leo III. 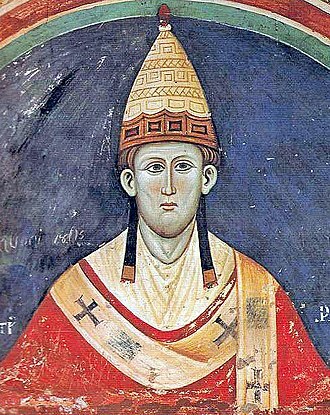 Pope Stephen IV was Pope from June 816 to his death in 817. The son of a Roman noble called Marinus, Stephen IV belonged to the family which produced the Popes Sergius II. Very popular among the Roman people, within ten days of Leo III’s death, he was escorted to Saint Peter’s Basilica and it has been conjectured that his rapid election was an attempt by the Roman clergy to ensure that the Roman emperor could not interfere in the election. With Louis’ invitation, Stephen left Rome in August 816, crossing the Alps together with Bernard, the King of the Lombards, in early October, the Pope and Emperor met at Rheims, where Louis prostrated himself three times before Stephen. At Mass on Sunday,5 October 816, Stephen consecrated and anointed Louis as emperor, at the same time he crowned Louis’ wife Ermengarde of Hesbaye, and saluted her as Augusta. This event has seen as an attempt by the Papacy to establish a role in the creation of an emperor. 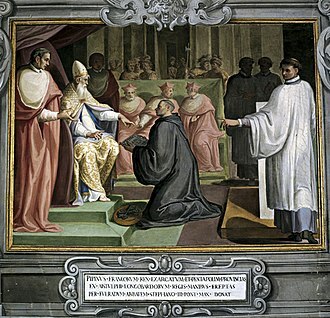 While with Louis, the emperor gave Stephen a number of presents and they renewed the pact between the Popes and the kings of the Franks, confirming the privileges of the Roman church, and the continued existence of the recently emerged Papal States. Irene of Athens, known as Irene Sarantapechaina, was Byzantine empress from 797 to 802. Before that, Irene was empress consort from 775 to 780 and she is best known for ending Iconoclasm. Irene was related to the noble Greek Sarantapechos family of Athens, although she was an orphan, her uncle or cousin Constantine Sarantapechos was a patrician and was possibly strategos of the theme of Hellas at the end of the 8th century. She was brought to Constantinople by Emperor Constantine V on 1 November 768 and was married to his son Leo IV on 17 December, on 14 January 771, Irene gave birth to a son, the future Constantine VI. 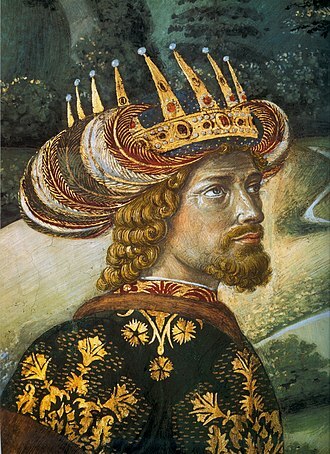 When Constantine V died in September 775, Leo succeeded to the throne at the age of twenty-five years. Leo, though an iconoclast, pursued a policy of moderation towards iconodules, but his policies became much harsher in August 780, according to tradition, he discovered icons concealed among Irenes possessions and refused to share the marriage bed with her thereafter. Nevertheless, when Leo died on 8 September 780, Irene became regent for their nine-year-old son Constantine, Irene was almost immediately confronted with a conspiracy that tried to raise Caesar Nikephoros, a half-brother of Leo IV, to the throne. To overcome this challenge, she had Nikephoros and his co-conspirators ordained as priests, as early as 781, Irene began to seek a closer relationship with the Carolingian dynasty and the Papacy in Rome. She negotiated a marriage between her son Constantine and Rotrude, a daughter of Charlemagne by his third wife Hildegard, during this time Charlemagne was at war with the Saxons, and would become the new king of the Franks. Irene went as far as to send an official to instruct the Frankish princess in Greek, Irene herself broke off the engagement in 787, Irene next had to subdue a rebellion led by Elpidius, the strategos of Sicily. Irene sent a fleet, which succeeded in defeating the Sicilians, Elpidius fled to Africa, where he defected to the Abbasid Caliphate. After the success of Constantine Vs general, Michael Lachanodrakon, who foiled an Abbasid attack on the eastern frontiers, Irenes most notable act was the restoration of the veneration of icons. Having chosen Tarasios, one of her partisans and her secretary, as Patriarch of Constantinople in 784. Einhard was a Frankish scholar and courtier. Einhard was from the eastern German-speaking part of the Frankish Kingdom and he was accepted into the hugely wealthy court of Charlemagne around 791 or 792. Charlemagne actively sought to amass scholarly men around him and established a school led by the Northumbrian scholar Alcuin. 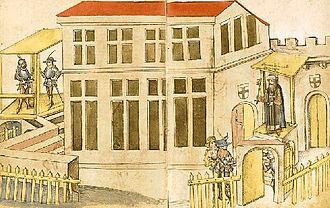 Einhard evidently was a builder and construction manager, because Charlemagne put him in charge of the completion of several palace complexes including Aachen. Despite the fact that Einhard was on terms with Charlemagne. In 814, on Charlemagnes death his son Louis the Pious made Einhard his private secretary, Einhard retired from court during the time of the disputes between Louis and his sons in the spring of 830. He died at Seligenstadt in 840, Einhard was married to Emma, of whom little is known. There is a possibility that their marriage bore a son and their marriage appears to have been exceptionally liberal for the period, with Emma being as active as Einhard, if not more so, in the handling of their property. It is said that in the years of their marriage Emma and Einhard abstained from sexual relations. Einhard made numerous references to himself as a sinner, a description of himself that shows his Augustinian influenced world view, to assuage such feelings of guilt he erected churches at both of his estates in Michelstadt and Mulinheim. In Michelstadt he saw fit to build a basilica completed in 827 and sent a servant, once in Rome, Ratleic robbed a catacomb of the bones of the Martyrs Marcellinus and Peter and had them translated to Michelstadt. Once there, the relics made it known they were unhappy with their new tomb, once established there, they proved to be miracle workers. 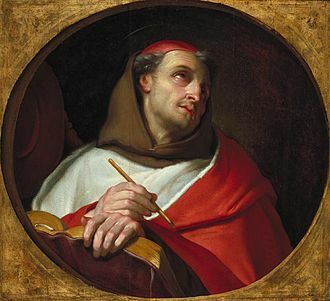 Although unsure as to why these saints should choose such a sinner as their patron, between 831 and 834 he founded a Benedictine Monastery and, after the death of his wife, served as its Abbot until his own death in 840. Local lore from Seligenstadt portrays Einhard as the lover of Emma, one of Charlemagnes daughters, Charlemagne found them at Seligenstadt and forgave them. During this period, there was an increase of literature, the arts, jurisprudence, liturgical reforms, and scriptural studies. The Carolingian Renaissance occurred mostly during the reigns of Carolingian rulers Charlemagne and it was supported by the scholars of the Carolingian court, notably Alcuin of York. Charlemagnes Admonitio generalis and Epistola de litteris colendis served as manifestos, the effects of this cultural revival were mostly limited to a small group of court literati. They applied rational ideas to social issues for the first time in centuries, providing a common language, kenneth Clark was of the view that by means of the Carolingian Renaissance, Western civilization survived by the skin of its teeth. 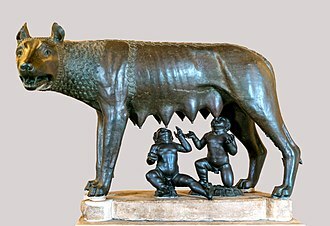 Instead of being a rebirth of new movements, the period was more an attempt to recreate the previous culture of the Roman Empire. In its earlier state of barbarousness, his kingdom had been touched at all by any such zeal. In our own time the thirst for knowledge is disappearing again, of even greater concern to some rulers was the fact that not all parish priests possessed the skill to read the Vulgate Bible. To address these problems, Charlemagne ordered the creation of schools in a known as the Charter of Modern Thought. A major part of his program of reform was to many of the leading scholars of the Christiandom of his day to his court. The Lombard Paul the Deacon was brought to court in 782 and remained until 787, theodulf of Orléans was a Spanish Goth who served at court from 782 to 797 when nominated as bishop of Orléans. Theodulf had been in competition over the standardization of the Vulgate with the chief among the Charlemagnes scholars. Alcuin was a Northumbrian monk and deacon who served as head of the Palace School from 782 to 796, after 796, he continued his scholarly work as abbot of St. Martins Monastery in Tours. Among those to follow Alcuin across the Channel to the Frankish court was Joseph Scottus, after this first generation of non-Frankish scholars, their Frankish pupils, such as Angilbert, would make their own mark. The courts of Louis the Pious and Charles the Bald had similar groups of scholars, the Irish monk Dicuil attended the former court, and the more famous Irishman John Scotus Eriugena attended the latter. Paderborn is a city in eastern North Rhine-Westphalia, capital of the Paderborn district. The name of the city derives from the river Pader and born, the river Pader originates in more than 200 springs near Paderborn Cathedral, where St. Liborius is buried. Paderborn was founded as a bishopric by Charlemagne in 795, although its history began in 777 when Charlemagne built a castle near the Pader springs. In 799 Pope Leo III fled his enemies in Rome and reached Paderborn, where he met Charlemagne and it was during this time that it was decided that Charlemagne would be crowned emperor. Charlemagne reinstated Leo in Rome in 800 and was crowned as Holy Roman Emperor by Leo in return, in 836, St. Liborius became the patron saint of Paderborn after his bones were moved there from Le Mans by Bishop Badurad. St. Liborius is commemorated in Paderborn every year in July with the Liborifest, the bishop of Paderborn, became a Prince of the Empire in 1100. The bishop had several buildings built, and the area became a place for the emperors to stay. The city was taken by Prussia in 1802, by the French vassal state Kingdom of Westphalia from 1807 to 1813, native Friedrich Sertürner, a pharmacists apprentice in Paderborn, was the first to isolate morphine from opium in 1804. In 1930, the See of Paderborn was promoted to archdiocese, during World War II, Paderborn was bombed by Allied aircraft in 1944 and 1945, resulting in 85% destruction, including many of the historic buildings. After the city was reconstructed in the 1940s and 1950s, Paderborn became an industrial seat in Westphalia. The British Army has retained a significant presence in the area, Paderborn is situated at the spring of the Pader river, approximately 30 kilometres east of Lippstadt and approximately 50 kilometres south of Bielefeld on the Pader river. The hills of the Eggegebirge are located east of the city, the city of Paderborn consists of the following Stadtteile, Paderborn has a population of over 144,000, of which approximately 10% are students at the local university. Additionally, about 10,000 members or relatives of members of the British armed forces live within Westfalen Garrison, 60% of the population are Catholics, 20% Lutherans and 20% other. Paderborn is the headquarters of the former Nixdorf Computer AG, which was acquired by Siemens in the early 1990s, the company is now known as Wincor Nixdorf which is still located in Paderborn, but Siemens retains a considerable presence in the city. 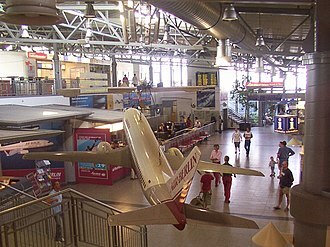 Paderborn has the largest computer museum in the world, the de, from 2001 to 2005 it hosted the RoboCup German Open. The town supports the Nordwestdeutsche Philharmonie for regular symphony concerts in the Paderhalle, the city is known today for its exhibitions in three museums, the Kaiserpfalz, The Diocesian Museum and the Art Museum - Städtische Galerie. The local baseball team, the Paderborn Untouchables, has won many German championships, and the local American Football team, in 2006 the Paderborn Baskets, the home basketball team of the city achieved the Bundesliga. Alcuin of York —also called Ealhwine, Alhwin or Alchoin—was an English scholar, clergy and teacher from York, Northumbria. He was born around 735 and became the student of Archbishop Ecgbert at York, at the invitation of Charlemagne, he became a leading scholar and teacher at the Carolingian court, where he remained a figure in the 780s and 90s. Alcuin wrote many theological and dogmatic treatises, as well as a few grammatical works and he was made Abbot of Tours in 796, where he remained until his death. The most learned man anywhere to be found, according to Einhards Life of Charlemagne, among his pupils were many of the dominant intellectuals of the Carolingian era. Alcuin was born in Northumbria, presumably sometime in the 730s, virtually nothing is known of his parents, family background, or origin. In common hagiographical fashion, the Vita Alcuini asserts that Alcuin was of noble English stock, and this statement has usually been accepted by scholars. Alcuins own work only mentions such collateral kinsmen as Wilgils, father of the missionary saint Willibrord, and Beornred, abbot of Echternach and bishop of Sens, if so, Alcuins origins may lie in the southern part of what was formerly known as Deira. The young Alcuin came to the church of York during the golden age of Archbishop Ecgbert and his brother. Ecgbert had been a disciple of the Venerable Bede, who urged him to raise York to an archbishopric, Ecgbert was devoted to Alcuin, who thrived under his tutelage. The York school was renowned as a centre of learning in the arts, literature. It was from here that Alcuin drew inspiration for the school he would lead at the Frankish court and he revived the school with the trivium and quadrivium disciplines, writing a codex on the trivium, while his student Hraban wrote one on the quadrivium. Alcuin graduated to become a teacher during the 750s and his ascendancy to the headship of the York school, the ancestor of St Peters School, began after Aelbert became Archbishop of York in 767. Around the same time Alcuin became a deacon in the church and he was never ordained as a priest and there is no real evidence that he became an actual monk, but he lived his life as one. 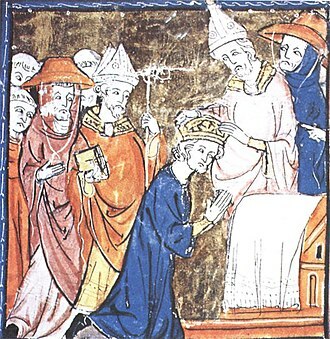 In 781, King Elfwald sent Alcuin to Rome to petition the Pope for official confirmation of Yorks status as an archbishopric and to confirm the election of the new archbishop, on his way home he met Charlemagne, this time in the Italian city of Parma. Pope Saint Leo I, known as Saint Leo the Great, was pope from 29 September 440 to his death in 461. He was a Roman aristocrat, and was the first pope to have called the Great. He is perhaps best known for having met Attila the Hun in 452 and he is a Doctor of the Church, most remembered theologically for issuing the Tome of Leo, a document which was a major foundation to the debates of the Ecumenical Council of Chalcedon. It was followed by a major schism associated with Monophysitism and Dyophysitism, according to the Liber Pontificalis, he was a native of Tuscany. About the same time John Cassian dedicated to him the treatise against Nestorius written at his request and these two men were the two highest officials in Gaul. 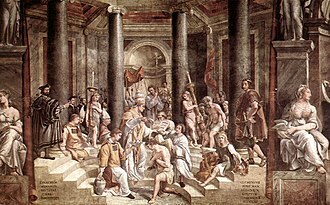 Leos work helped to solidify political and religious unity in his area of the Roman Empire, during his absence on this mission, Pope Sixtus III died, and Leo was unanimously elected by the people to succeed him. On 29 September, he entered upon a pontificate that was to be epoch-making for the centralisation of the government of the Roman Church, Leo defends the true divinity and the true humanity of the one Christ against heretical one-sidedness. He takes up this topic in many of his sermons, to Leo the Great, Mariology is determined by Christology. If Christ were divine only, everything about him would be divine, only his divinity would have been crucified and resurrected. Mary would only be the mother of God, and Christians would have no hope for their own resurrection, the nucleus of Christianity would be destroyed. The most unusual beginning of a human life through her was to give birth to Jesus. Leo contributed to the development of the doctrine on papal primacy, based on his devotion to St Peter and on the veneration for the Apostle. Besides recourse to biblical language, Leo describes his own relationship with St Peter in terms derived from Roman law. He calls himself the heir and deputy of Peter, having received his apostolic authority and being obliged to follow his example. 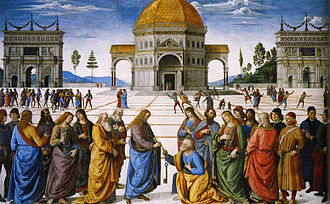 On the one hand, Peter stands before him with a claim on how Leo is to exercise his office, on the hand, Leo, as the Roman bishop, represents the Apostle. The Holy Roman Empresses were crowned as well. Thereafter, until the abolition of the empire in 1806, no further crownings by the Pope were held, successors of Charlemagne were crowned in Rome for several centuries, where they received the imperial crown in St. Peters from the pope. The Iron Crown of Lombardy was conferred in the Church of St, once a candidate was selected, the new emperor was led to the high altar of the cathedral and seated. He was conducted to a gallery over the entrance to the choir, the coronation itself took place on a subsequent day. These three Archbishop-Electors meet the Emperor-elect at the entrance of the church and the Archbishop of Cologne says the prayer, everlasting God, your servant. etc. Then the choir sings the antiphon, the angels sent forth. etc. as the Emperor-elect, the Archbishop of Cologne said the prayers, who knows the human race. etc. and Almighty and everlasting God of heaven and earth. etc. The Mass is begun, the propers being those of the Feast of the Epiphany, after the opening collect, the collect for the Feast of St.
Michael. After the sequence is sung the Litany of the Saints and the Archbishop of Cologne puts six questions to the Emperor-elect,1, will he defend the holy faith. 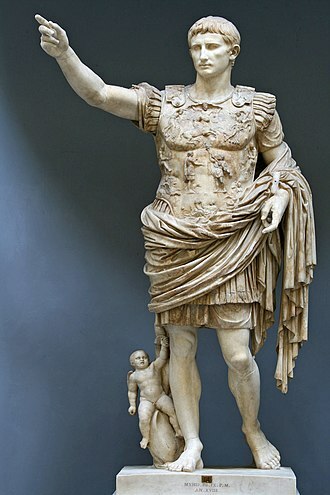 Will he defend the holy church, will he maintain the laws of the Empire. Will he show due submission to the Pope, to each of these he responds, I will. The Emperor-elect lays two fingers on the altar and swears, the Recognition followed and when the Emperor-elect is presented and asked if those assembled accepted him as their king, they respond, Let it be done three times. The Archbishop of Cologne said the prayers, Lord, amen. etc. and on the palms of both hands. He was vested in the robes, which included buskins, a long alb, a dalmatic, stole crossed priest-wise over the breast, gloves. The sword was given the German king with the words, Receive this sword at the hands of us bishops. etc, the ring was given him with the words, Receive this ring of royal dignity. etc. The sceptre and orb are both given to the king with the words, Receive this rod of virtue and equity. The pope is the Bishop of Rome and, the leader of the worldwide Catholic Church. The current pope is Francis, who was elected on 13 March 2013, the office of the pope is the papacy. The pope is considered one of the worlds most powerful people because of his diplomatic and he is head of state of Vatican City, a sovereign city-state entirely enclaved within the Italian capital city of Rome. 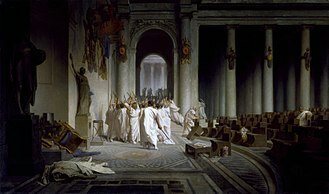 The papacy is one of the most enduring institutions in the world and has had a prominent part in world history, the popes in ancient times helped in the spread of Christianity and the resolution of various doctrinal disputes. In the Middle Ages, they played a role of importance in Western Europe. Currently, in addition to the expansion of the Christian faith and doctrine, the popes are involved in ecumenism and interfaith dialogue, charitable work, who originally had no temporal powers, in some periods of history accrued wide powers similar to those of temporal rulers. In recent centuries, popes were gradually forced to give up temporal power, the word pope derives from Greek πάππας meaning father. The earliest record of the use of title was in regard to the by deceased Patriarch of Alexandria. Some historians have argued that the notion that Peter was the first bishop of Rome, the writings of the Church Father Irenaeus who wrote around AD180 reflect a belief that Peter founded and organised the Church at Rome. Moreover, Irenaeus was not the first to write of Peters presence in the early Roman Church, Clement of Rome wrote in a letter to the Corinthians, c. 96, about the persecution of Christians in Rome as the struggles in our time and presented to the Corinthians its heroes, the greatest and most just columns, the good apostles Peter and Paul. St. Ignatius of Antioch wrote shortly after Clement and in his letter from the city of Smyrna to the Romans he said he would not command them as Peter and Paul did. Given this and other evidence, many agree that Peter was martyred in Rome under Nero. Protestants contend that the New Testament offers no proof that Jesus established the papacy nor even that he established Peter as the first bishop of Rome, using Peters own words, argue that Christ intended himself as the foundation of the church and not Peter. The Bishop of Lichfield is the ordinary of the Church of England Diocese of Lichfield in the Province of Canterbury. The diocese covers 4,516 km² of the counties of Powys, Shropshire, the bishops seat is located in the Cathedral Church of the Blessed Virgin Mary and Saint Chad in the city of Lichfield. The Bishops residence is Bishops House, Lichfield, in the past, the title has had various forms. The currently bishop is Michael Ipgrave, following the confirmation of his election on 10 June 2016, the diocese of Mercia was founded 656 by Diuma with its see at Repton. When Chad was made Bishop in 669, he moved his seat to Lichfield, in 691 the area over which the bishop held authority was divided to form the smaller dioceses of Lichfield, Lindsey and Hereford. It was briefly the seat of an archbishop under Hygeberht from 787 to 799 during the ascendancy of the kingdom of Mercia. Offa, King of Mercia seemed to resent his own bishops paying allegiance to the Archbishop of Canterbury in Kent who, whilst under Offas control, was not of his own kingdom of Mercia. Offa therefore created his own archbishopric in Lichfield, who presided over all the bishops from the Humber to the Thames, in 786 and it was vehemently opposed, but Offa and the papal representatives defeated Jænberht, Archbishop of Canterbury, installing Hygeberht as the new Archbishop of Lichfield. Pope Adrian sent Hygeberht his ceremonial garment, obviously denoting his support for this move, in gratitude, Offa promised to send an annual shipment of gold to the pope for alms and supplying the lights in St. Peters church in Rome. The bishops seat was moved to Chester in 1075. From 1228 Bishop of Coventry and Lichfield became the title with seats at both cathedrals, though various older names remained in common usage. After the Reformation of the 1530s the cathedral at Coventry was demolished, in 1837 the ancient bishopric was divided. The archdeaconry of Coventry was transferred to the see of Worcester, the diocese of Coventry and Lichfield 1603–1642. Oligarchy and conflict, Lichfield Cathedral clergy in the sixteenth century in Midland History,19. Baroque façade of Santa Susanna by Carlo Maderno (1603). Fresco detail in Santa Susanna depicting the martyrdom of St. Felicity, by Paris Nogari. A 17th-century replica of Santa Susanna in Lviv, Ukraine. 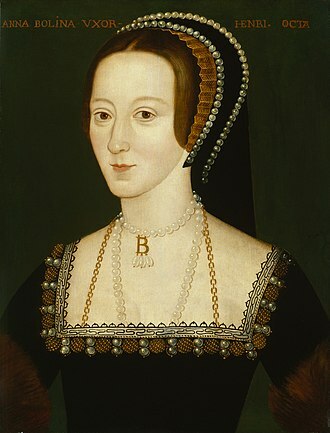 Anne Boleyn was found guilty of adultery and treason and executed in 1536. There is controversy among historians as to whether she had actually committed adultery. The medieval influence of Pisa in Corsica can be seen in the Romanesque-Pisan style of the Church of Aregno. Interior of the Mosque–Cathedral of Córdoba formerly the Great Mosque of Córdoba. The original mosque (742), since much enlarged, was built on the site of the Visigothic Christian 'Saint Vincent basilica' (600). 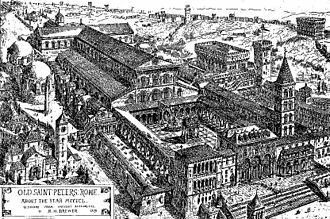 19th-century drawing of St. Peter's Basilica as it is thought to have looked around 1450. The Vatican Obelisk is on the left, still standing on the spot where it was erected on the orders of the Emperor Caligula in 37 A.D.
Fontana della Pigna (1st century AD) which stood in the courtyard of the Old St. Peter's Basilica during the Middle Ages and then moved again, in 1608, to a vast niche in the wall of the Vatican facing the Cortile della Pigna, located in Vatican City, in Rome, Italy. Carolingian minuscule, one of the products of the Carolingian Renaissance. Alcuin (pictured center), was one of the leading scholars of the Carolingian Renaissance. Pope John Paul II vested in the pallium. Saint Leo Magnus (17th century) by Francisco Herrera the Younger, in the Prado Museum, Madrid. 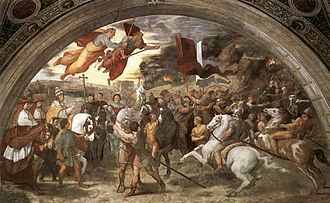 Raphael's The Meeting between Leo the Great and Attila depicts Leo, escorted by Saint Peter and Saint Paul, meeting with the Hun king outside Rome. 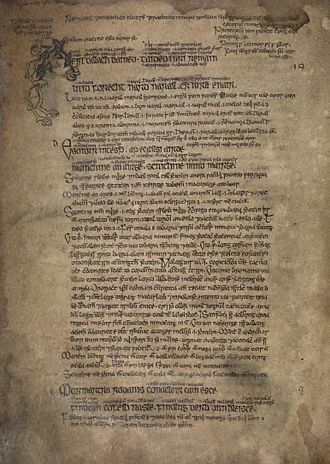 Excerpt from the Irish Feastology of Oengus, presenting the entries for 1 and 2 January in the form of quatrains of four six-syllabic lines for each day. In this 16th-century copy (MS G10 at the National Library of Ireland) we find pairs of two six-syllabic lines combined into bold lines, amended by glosses and notes that were added by later authors. The Turkish atrocities in Bulgaria (1876). On 3 April 2011, Batak massacre victims were canonized as saints. 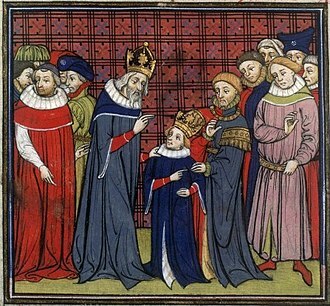 The poem details the meeting between Charlemagne (pictured) and Pope Leo III, in AD 799. Pope Leo III is the titular Leo papa discussed in the poem. The donation of Pepin the Younger to Pope Stephen II, in 754, creates the Papal States. Alcuin, roof figure, Museum of History of Arts, Vienna.